gm = multicuboid(W,D,H) creates a geometry by combining several cubic cells. 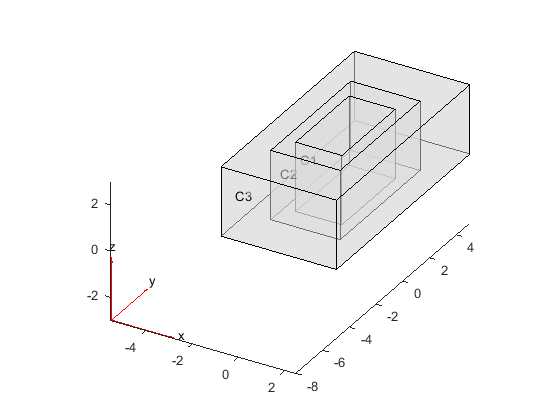 When creating each cuboid, multicuboid uses the following coordinate system. gm = multicuboid(W,D,H,Name,Value) creates a multi-cuboid geometry using one or more Name,Value pair arguments. Create a geometry that consists of three nested cuboids of the same height and include this geometry in a PDE model. Create the geometry by using the multicuboid function. The resulting geometry consists of three cells. Include the geometry in the model. 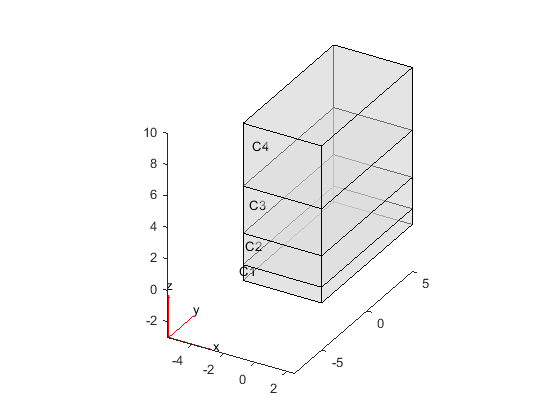 Create a geometry that consists of four stacked cuboids and include this geometry in a PDE model. Create the geometry by using the multicuboid function with the ZOffset argument. The resulting geometry consists of four cells stacked on top of each other. 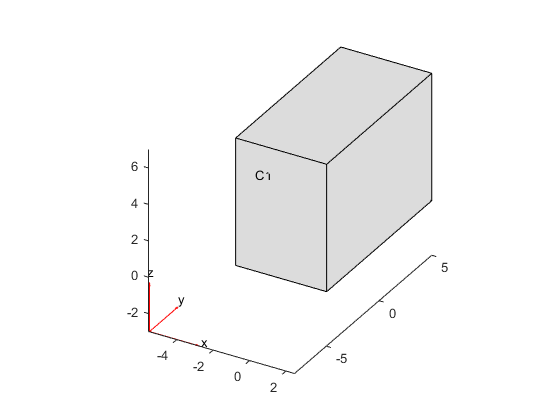 Create a geometry that consists of a single cuboid and include this geometry in a PDE model. Use the multicuboid function to create a single cuboid. The resulting geometry consists of one cell. 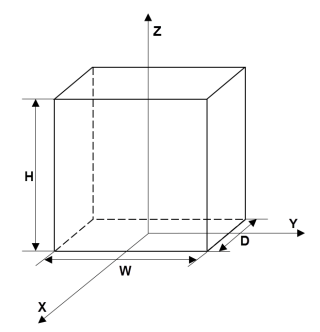 Create a hollow cube and include it as a geometry in a PDE model. 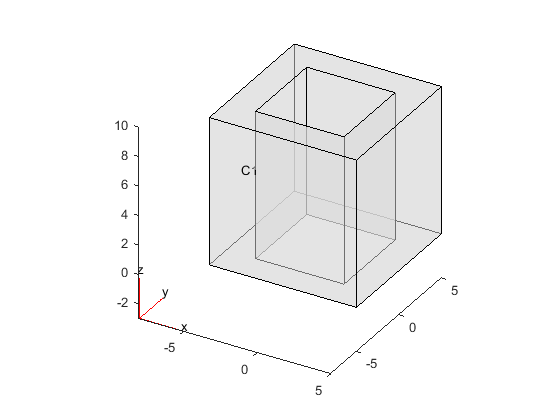 Create a hollow cube by using the multicuboid function with the Void argument. The resulting geometry consists of one cell. Cell width, specified as a positive real number or a vector of positive real numbers. If W is a vector, then W(i) specifies the width of the ith cell. Width W, depth D, and height H can be scalars or vectors of the same length. For a combination of scalar and vector inputs, multicuboid replicates the scalar arguments into vectors of the same length. All cells in the geometry either must have the same height, or must have both the same width and the same depth. Cell depth, specified as a positive real number or a vector of positive real numbers. If D is a vector, then D(i) specifies the depth of the ith cell. Cell height, specified as a positive real number or a vector of positive real numbers. If H is a vector, then H(i) specifies the height of the ith cell. Z offset for each cell, specified as a vector of real numbers. ZOffset(i) specifies the Z offset of the ith cell. This vector must have the same length as the width vector W, depth vector D, or height vector H.
The ZOffset argument is valid only if the width and depth are constant for all cells in the geometry. Empty cell indicator, specified as a vector of logical true or false values. This vector must have the same length as the width vector W, depth vector D, or the height vector H.
The value true corresponds to an empty cell. By default, multicuboid assumes that all cells are not empty. Geometry object, returned as a DiscreteGeometry Properties object. multicuboid lets you create only geometries consisting of stacked or nested cuboids. For nested cuboids, the height must be the same for all cells in the geometry. For stacked cuboids, the width and depth must be the same for all cells in the geometry. Use the ZOffset argument to stack the cells on top of each other without overlapping them. multicuboid does not let you create nested cuboids of the same width and depth. The call multicuboid(w,d,[h1,h2,...]) is not supported.